Grab your gear and put on your game faces, Powderpuff 2k18 is underway. Popping off on June 1st, the juniors and seniors that are participating have started to practice after school on the field. The practices are held on every Tuesday, Wednesday, and Thursday at 3:15 pm to 5 pm. 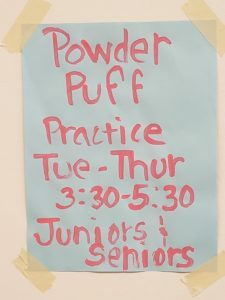 It is never too late to join, so if you’re a girl, in the 11th or 12th grade, and are interested in playing Powderpuff football, come join the team on any Tuesday, Wednesday, or Thursday on our very own Hollywood High School field. “Going into Powderpuff I didn’t think much of it, but now it has taught me more about football and I have created bonds with the players there.” said Linnssy Munoz, SAS Junior. Also are you interested in Powderpuff, but are a boy? Boys are able to apply to be cheerleaders for the half time show. For more information, meet at the field afterschool on Tuesday, Wednesday, or Thursday before June 1st.